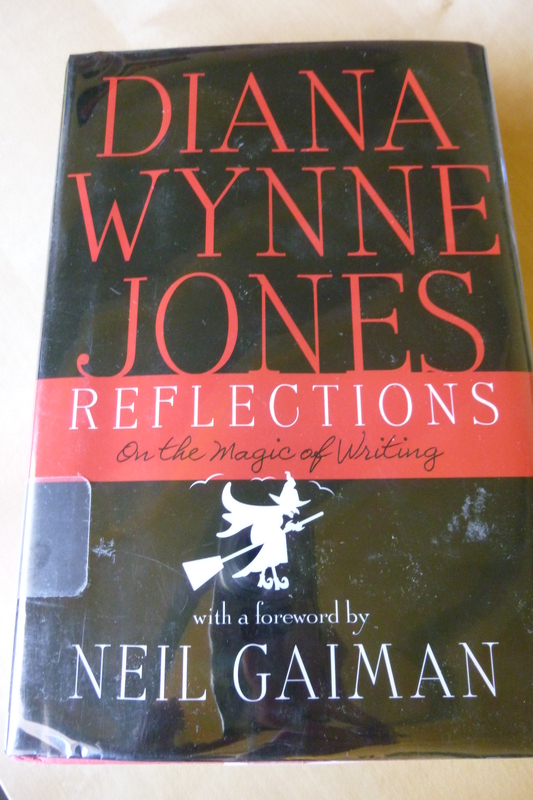 Reflections by Diana Wynne Jones is not quite a book about writing…and not quite an autobiography…but a good bit of both. Diana Wynne Jones is one of my favorite children’s fantasy authors, so I was eager to read her book of essays “On the Magic of Writing” when it was published this fall. I feel like this is less about writing than it is about storytelling, which are not quite the same thing. It’s not much about the craft of writing, and definitely not about publishing. It’s about something more integral, about the art of crafting a story rather than how that story becomes a novel. So don’t come here looking for one essay about how to create a character, another about plot arcs, or a third about the advantages of outlining. Some of those elements may come in, but you’ll only find them as one possible aspect of an essay about, for example, the influence of Anglo-Saxen myths on modern fantasy, or the ultimate responsibility of writing for children. That second topic may be one of my favorites addressed here, in the essay “Writing for Children: A Matter of Responsibility.” That sounds rather weighty and apt to be moralizing, but it isn’t at all. Without being overwhelming about it and certainly without advocating for Victorian stories where bad little children swiftly meet bad ends, Diana Wynne Jones gets at the influence books have on children. I remember once in college I mentioned in conversation with an acquaintance that I wanted to write young adult novels. She remarked, “so you can be an influence on twelve-year-olds everywhere.” She clearly meant it scornfully, but…yes! I’ve certainly “met” books later in life that have influenced me, but I think stories touch us and shape us in childhood in a way that later books don’t. Diana Wynne Jones obviously understood that, and obviously believed in the power of books to be a positive influence. I don’t mean that her books are ever moralizing, but I think they do build strength and courage and belief in oneself and one’s own imagination. Those, of course, are good lessons for anyone, at any age. I mentioned autobiography at the beginning, and the book frequently tells stories about Diana Wynne Jones’ own life. She tells wonderful, improbable stories about growing up in a town where everyone was mad, during World War II when the whole world had run mad. She talks about her own writing process (something that always fascinates me about authors I love), about the influences on some of her novels, and about her experiences being an author. If there’s a flaw in the book, it’s that some of the stories become repetitive. This is a compilation of essays and talks that were originally spread across years, and when they’re all put together, you find that she describes the same details of her childhood three or four times. Perhaps slightly heavier editing would have resolved some of this. As it stands, it’s not too big an annoyance, although it may be an argument for reading this a few essays at a time, rather than straight-through. If you really want a book about writing, I recommend Writing Magic by Gail Carson Levine. But if you want a book about stories, and about Diana Wynne Jones, this collection is delightful. And perhaps by focusing more on that deeper core, she’s created a book that would be as interesting to readers as it is to writers. Really, to anyone who enjoys stories–particularly if you enjoy Diana Wynne Jones’ stories! Anyone else? Tell me about yours! ‘Reflections’ is a wonderful hotch-potch of a book, much like the quote you give of her books being a mess held together by a story — in this case her own life. I’ve described ‘House of Many Ways’ as a book of snapshots, and that applies equally here. Needless to say I’ve reviewed this too on my blog! So of course I had to go find your review…great one, and thanks for the insights! Thank you, glad you liked it! Such an inspirational writer. Sounds like a interesting read. Reminds me of On Writing by Stephen King which is more about how he writes and what inspires, interspersed with details about his life when he was writing some of his famous works. I think it was a nice blend. I will have consider reading this too. I’ve heard good things about On Writing too…might have to read it some time! I think a writer can definitely have an influence on a reader without resorting to moralizing. Isn’t that what separates a great story with a message from a story that is really more of a lecture about the proper way to be or to act? Exactly! My favorite stories are ones with a message…but if ALL you have is a message and no story, I don’t think you even get your message across as effectively. Lovely review, Cheryl! My daughter, also a writer, loves DWJ, and I’m a bit of a fan myself. I’ll have to get her a copy!